For much of the season, the Indians and Cubs appeared to be afflicted by the same sort of World Series hangover. Is it possible that last year’s Game 7 was so intense, crazy, joyous, and heartbreaking that its effects would linger? Most likely not, no, but it makes for a nice, tidy narrative anyway. Some nine months after the epic, decisive game, however, an important part of the Indians’ roster appears to be getting its act together just as the high-leverage games of September and beyond draw near. Cleveland’s rotation was expected to be a strength entering the season, but due to injury (Corey Kluber missed a month due to a lower-back issue) and performance inconsistency (see: Danny Salazar and Trevor Bauer), Indians starters combined for an American League-worst 4.78 ERA in April and then a 4.81 ERA in May (which ranked 10th in the AL). Cleveland’s rotation was a bit unlucky as a group, probably. 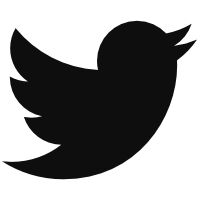 They were hurt by a 16.4% HR/FB rate in April and an 18.2% mark in May. What was expected to be a strength, the rotation, was one of the club’s early-season weaknesses. Over the past 30 days, however, Indians starting pitchers possess the league’s highest collective WAR (4.8), and it isn’t particularly close: the next best team by that measure is Boston, at 3.3*. Cleveland’s starters lead baseball in FIP (3.04) over the last 30 days, nearly a half-run better than the second-place Dodgers (3.52). The Indians have also produced the top xFIP (3.18), the Dodgers again placing a distant second (3.55). *Numbers entering play on Wednesday. Perhaps the best, most simple measure of dominance is strikeout-minus-walk rate. The Indians blow away the field by that measure, too. Since his return from the disabled list, Kluber has struck out nearly 40% of batters (151 of 378), a rate only five relief pitchers have matched this season. Perhaps only Chris Sale is a superior, healthy starting-pitching option to Kluber in the majors at the moment. Kluber has won a Cy Young award, he’s finished in the top three of the voting in three straight years, and he’s never been better. Trevor Bauer also struck out 14 in a single game, a career-high mark for him — in this case, as part of a May 30th start the Oakland A’s. The right-hander has simplified his pitch mix and perhaps found a road map to another level. Since that start, Bauer has struck out 85 in 77 innings to go along with a 3.74 ERA, 3.44 FIP, and 3.57 xFIP. Bauer has followed something of the Rich Hill and Drew Pomeranz plan and has begun to throw his best pitch — his curveball — at a much higher rate. Bauer is throwing the curve at a 33.2% rate since that start against hte A’s. Since, making the change, Bauer — who struck out 11 Red Sox in 6.2 innings Monday — has strung together some of the best performances of his career and kept himself in the rotation. His curveball has the second-most vertical movementin the game this season. Salazar has returned from a bullpen demotion and DL stint to string together four consecutive productive outings, often showing dominant form since his return. He struck out 10 Twins without walking a batter Tuesday evening. He’s relied more heavily upon his high-spin fastball — a pitch that ranks third among all four-seamers in whiff rate (31.3%) — to better get ahead of hitters. His excellent split-change remains. The Indians coaching staff wanted Salazar to be more aggressive and to get more on top of the ball mechanically. He has apparently made strides in each department. Since returning, Salazar has a 64.5% first-pitch strike rate and a 16.9% swinging-strike rate. He ranks second in ERA (1.39) and strikeouts (44) since coming off the DL. On Saturday, Carlos Carrasco didn’t allow a hit until the seventh inning against the Rays. Carrasco has some of the best stuff among all starting pitchers, with a slider, changeup, and curveball that have all ranked as above-average pitches, according to linear weights, since 2014. The only blemish over the last 30 days for the Indians’ rotation is Josh Tomlin’s trip to the disabled list. While Tomlin has excellent command, he has less upside than other starting options. Cleveland had briefly utilized a six-man rotation until the Tomlin injury. Assuming the club advances to divisional-round play this postseason, the Indians could bolster their bullpen with a Clevinger, Salazar, or Bauer in a relief role where their stuff might further play up. 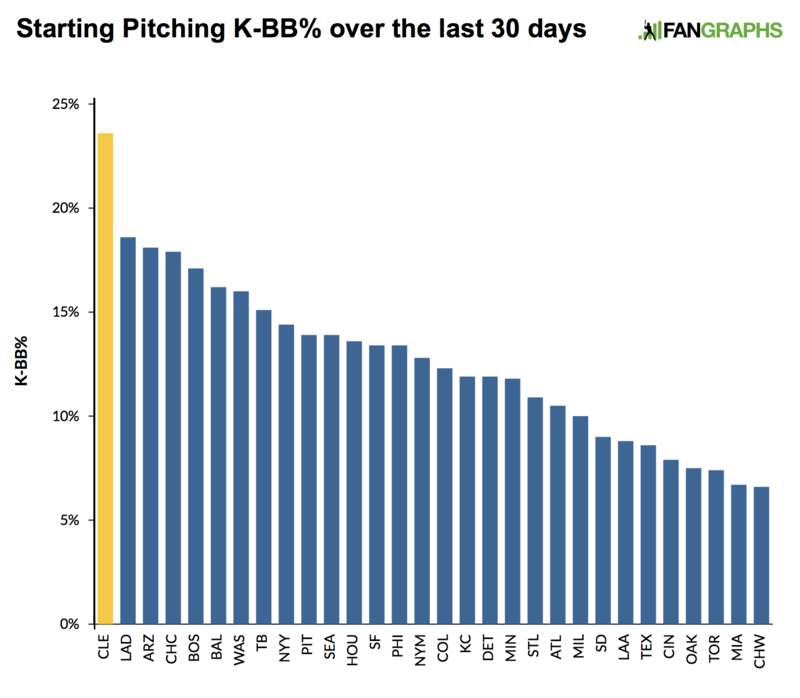 What it all means is that the Indians’ rotation — now at nearly full strength and with a number of its members enjoying performance spikes and skill growth — is now one of the more (if not most) formidable rotations in the game. It was expected to be just that, but it’s taken a while to get there due to injuries in the second half of last season and more injuries — and uneven performance — early this season. This development perhaps means the Astros are not the runaway AL front runner they were just a month ago. The Indians might have won a World Series last year had their rotation been healthy. Heck, the Indians might have won their first title since 1948 with just one more healthy rotation option. They reached Game 7 with Kluber, Andrew Miller, Cody Allen, and duct tape. Their rotation is healthy now. 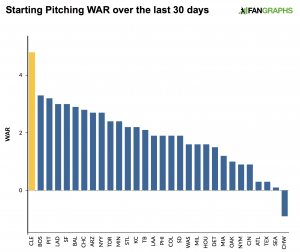 It’s been the most productive in the game over the last 30 days and now ranks as the top rotation in the majors, by WAR, overall for the season. If this production continues, no team will want to face the Indians in October. Cleveland might not catch the Astros for status as the best regular-season team in American League in 2017. But major-league baseball is a sport of two seasons, which have different dynamics, and the Indians are well positioned for the second season. We hoped you liked reading Cleveland’s Rotation Is Distancing Itself from the Pack by Travis Sawchik! With all the narrative around the Dodgers, Astros, Nationals, and Boston / New York, the Indians seem to be the forgotten team in the playoff mix. They’re on pace to win 90 games despite underperforming their base runs record by 7 wins to date. Last week, NY favoring hosts on a NY sports radio station noted that Boston is being given especially little attention this year (until these past couple of weeks when they’ve gotten “hotter”). I know it’s a cliche to think everything in baseball is NY/Boston-centric, but Boston has been plenty slept on in this season…as, I agree, has Cleveland. For much of this season, the AL Central and the AL East have been a jumble. Cleveland and Boston have both recently emerged as they have begun to clearly rise from the pack. I’d say they have followed similar paths of attention. Both teams entered the season with firm “favorite” expectations, and I would argue that both were slept on as people got caught up too much in smaller sample results. To me, it was always likely that they were emerge, and now it’s happening. But let’s not pretend that Cleveland has been especially (and, it would seem you’re implying, unfairly) ignored. They haven’t been alone.